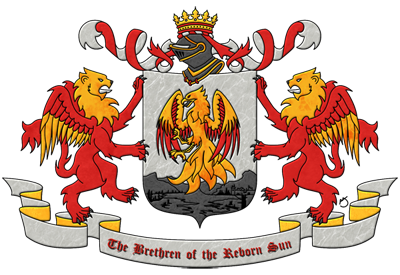 "May the Sun Never Dim"
Let it be hereby known that the Brethren of the Reborn Sun, chartered by the Most Regal King of Cormyr, Fifth of His Name, Azoun, and the Most Pious Church of Lathander, hereby declare it as a Knightly Ordered, endowed with all privileges and responsibilities that are entitled therein. That they may illuminate the vast, untamed Wilderness of the North with the Light of Civilization and the Pious Strength of the Gods, and bring to heel all dissidents to whom would fight against King and Just Law. The Castle of the Redhart, disbanded in the Siege of 1384 when they made war on the then city-state of Arabel, by which they may govern by the principals of the Church of Lathander and the guidelines of their own order. The privilege of enforcing the King's peace, with the consent of the landed lords that border their most pious demesne. That they shall, in times of war, be entitled forthwith compensation for their service to the Warden of the North for aid they provide in battle. That the one titled Grandmaster be granted the status of both High Priest of Lathander, and Lord of Cormyr, landed in the Castle, whose borders shall not exceed their walls unless granted land later. That the ones titled, "Knight Commanders," have the privilege of Nobility of the rank of Knight, and are thusly, entitled to the same respect from the common man. To maintain the security of the lands against evil. To provide security in times of crisis to all goodly folk seeking refuge from battle. That the Brethren of the Reborn Sun pursue civilizing grace upon the untamed frontier of Cormyr's Northern March. That the Brethren shall only uphold the peace in lands that their lords consent to such, or lands granted upon them, and not pursue criminals not immediately on such lands for personal prosecution, and shall turn over such to the Militia or entitled law-giving force.